One of the joys of film documentaries is that they can open your eyes to worlds heretofore hidden. But the joy can turn to pain if the work is poorly crafted (a gazillion docs), or contains a political or social agenda. Happily none of these faults beset the new documentary film IZ: Somewhere Over The Rainbow – it’s all joy. IZ, of course, is Israel Ka'anoi "Brudda Iz" Kamakawiwo'ole, a now-legendary musician and ukulele player from Hawaii. IZ died in 1997, age 38, and each year since his legend has grown. IZ is most famous for his ukulele renditions of Somewhere Over the Rainbow/ What a Wonderful World. Before continuing I recommend you click on the link and listen once or twice. IZ’s uke renditions have appeared often in movies and TV. He’s also credited with revitalizing interest in the uke, which had waned in Hawaii by the mid 1960s. (Though considered an Hawaiian instrument, the uke came to Honolulu from Portugal in 1879.) When IZ died it is said that all Hawaii mourned; more than 10,000 people turned out for a state funeral. IZ was the son of Henry Kalei'aloha Naniwa and Evangeline Leinani Kamakawiwo'ole. He was surrounded by music growing up. Uncle Moe Keale was a musician, and his parents worked at a popular Waikiki bar, Harris Kalaeikini’s Steamboat Lounge, where many Hawaiian musicians performed (including Don Ho and Peter Moon). By the age of 6, Kamakawiwo’ole had already mastered the ukulele, just by watching others. He first performed publicly at age 10, along with is older brother ‘Skippy’. As a teenager he and his bother formed a band with other musicians, ‘Makaha Sons of Ni’ihau’. They played native Hawaiian music, and through the 1970s and 80s grew in popularity; over 15 years they recorded 10 albums and toured the continental United States. They performed on a Jerry Lewis telethon. In 1982 IZ married his high school sweetheart, and shortly after that his brother ‘Skippy’ passed away from a heart attack. The band quit playing for a while. In 1983 IZ and his wife (Marlene Ku'upua Ah Lo Kamakawiwo'ole) welcomed the arrival of a daughter. In the mid 1980s Kamakawiwo'ole began to show a strong interest in the Hawaiian rights movement, publically voicing concerns for his fellow native people. This is all covered in the film in a non-judgemental fashion. The film is also non-judgemental about his weight. He was 6'2" and at one point tipped the scales at 758 lbs. It's what killed him. But there is no moralizing here. It is what it is (or was). In 1993, after a 17-year career performing and recording with his band, IZ quit due to ill health. 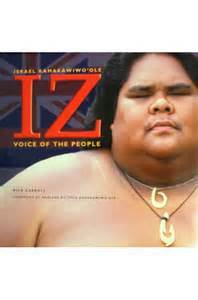 Sticking to Hawaii (his obesity making it diffiult to travel), IZ launched a solo career and won many awards. Alone he produced four albums for Big Boy Records, which as a result became the most successful small recording company in Hawaii music history. His song N Dis Life spent 39 weeks on Billboard's World Music chart, peaking at #8. IZ died June 26, 1997, the cause said to be weight-related respiratory failure. After the state funeral in Oahu (an honor afforded only two other people in Hawaii's history), his body was cremated, and the ashes scattered at Makua Beach on the Waianae coast where he was raised. He was survived by his wife 14-year-old daughter, Ceslianne Wehekealake'alekupuna Ah Lo Kamakawiwo'ole. This is not the first movie about IZ. A little-known TV documentary in 2004, IZ: The Man Behind the Music, also covered his life and music. Some criticized that movie as substandard for sound and video; for whatever reason it was poorly received (IMDB rating 6.8 based on only 5 reviews). IZ: Over the Rainbow is first class all the way and is now in theaters; it will be awhile before the movie makes it to DVD and your TV set. A final word about the ukulele. It is not a small guitar. The uke has 4 strings and is considered (by some ignorant snobs) a toy. The guitar has 6 strings and has been instrument of choice for some of the greatest pop musicians: Presley, Baez, Springsteen and Dylan, to name a few. Quick: name a popular uke performer player, one people pay money to see. 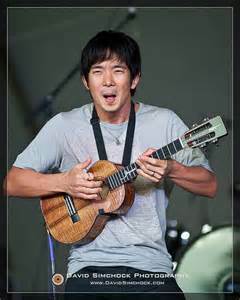 If you named Jake Shimabukuro, you either play the uke yourself or are way up in the musical knowledge category. Well, let me tell you. The uke is not a toy, and what IZ (and Shimabukuro, James Hill, Taimane Gardner and many others) do with it will dazzle your senses. So if you have zero knowledge of the uke (most people), but love music (most people), go see IZ: Somewhere Over The Rainbow. The best word to describe this biopic is entertaining. But it’s also educational and inspirational. I learned something and was inspired. What more could you ask for?